Why Do People Say They Support Statehood for Puerto Rico but not D.C.? Two weeks ago, we wrote a post analyzing a Data for Progress question about support for statehood for DC and Puerto Rico. What we found was a bit odd: there was significantly more support for Puerto Rico statehood than for DC statehood. In that post, we explored several possible explanations, ranging from partisanship to race to age. So why is support split like this? The answer is straightforward: people (Democrats and Republicans) see Puerto Rico as a place people actually live, which just suffered a hurricane, and where the people have a right to representation, while they (especially Republicans) see DC as the capital city, a place where for politicians, where the only case for statehood is increasing Democrats’ political power. Would you support or oppose granting statehood, including full representation in Congress, to Washington, DC, currently a Federal District? Would you support or oppose granting statehood, including full representation in Congress, to Puerto Rico, currently a US Commonwealth? to which respondents could respond if they strongly supported, somewhat supported, neither supported nor opposed, somewhat opposed, strongly opposed, or were unsure; respondents also had the opportunity to explain their choice in an open ended response. 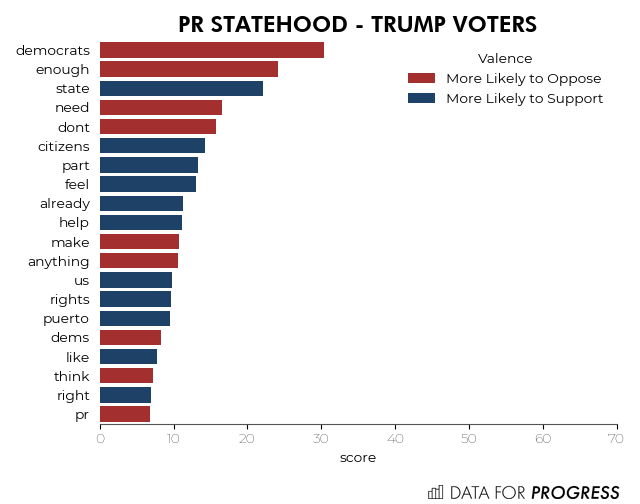 Creating a model that aims to predict why Clinton/Trump voters respectively support statehood or not generates a set of words strongly associated with support or oppose. Blue indicates support, red indicates opposition. Two things stick out. For Clinton voters, most of whom support statehood in both cases, statehood in Puerto Rico is a right, whereas statehood in DC is important because people in the district deserve representation. This rhetorical difference is reflected in Trump voters who support Puerto Rican statehood (very few Trump voters are for DC statehood): they (correctly) see Puerto Ricans as citizens, but tend not to think about the people who live in Washington beyond politicians. Beyond seeing which words predict support or opposition, we can also try to cluster responses, to see what arguments people make in support or opposition. Clustering on supportive and unsupportive responses for Puerto Rico and DC reveals some interesting patterns. Looking at support for Puerto Rican statehood, most people argue that the people of Puerto Rico have a right to representation, that they deserve representation, because they are American citizens. Another sizeable contingent is focussed on the fairness of getting to vote. A third major argument is that Puerto Rican people need help in the wake of the hurricane, and should therefore be supported. The rest of the arguments pulled out fall into similar buckets as the first two, focussing on giving people a voice, ensuring representation, taxation without representation, and the idea that it would be “good”. Turning to DC statehood support, the majority of people are focussed on fairness and the boon it would offer for Democrats (this entire cluster is made up of self identifying democrats). A second argument is centered on the right to vote, but many fewer than in the Puerto Rico case (it is of note that DC does vote for president, but they don’t have representatives in Congress; Puerto Rico does not vote for president or have representatives). The third argument is similar, all about deserving representation. In making the against Puerto Rican statehood case, people draw on a much more diverse set of arguments (in the against DC case as well). The number one argument people cite is about money. The next most popular response is that Democrats will get votes, and that statehood is a partisan move. People also argue the Puerto Rico is already a territory, and that we have enough states to take care of already. Lots of people similarly don’t think we need to make Puerto Rico a state, and that change is unnecessary. Like the “for” arguments, people tend to see DC statehood as a more partisan move, responding that it is unfair to Republicans to make DC a state. The second most popular answer is that it is a political move to give DC the vote. The third and fourth most common responses are also about Democrats gaining power. A surprisingly popular argument against DC statehood seems to be that people like the number 50 (arguments #1 and #9). Some think it is unnecessary nonsense (#4). So people see Puerto Rico as a place people actually live, which just suffered a hurricane, and where the people have a right to representation, while they see DC as the capital city, where the only case for statehood is increasing Democrats’ political power. These arguments line up with the case made about Trump/Clinton voter support. Nic Fishman (@njwfish) is a senior adviser to Data for Progress and a student at Stanford University, where he studies data science.